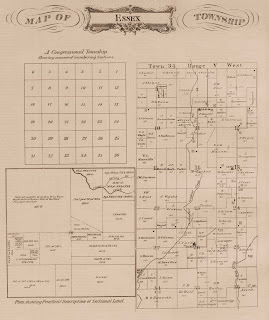 The political existence of Porter County, Indiana, was initiated in March 1835 when the county commissioners of LaPorte County, which had jurisdiction of the land now comprising the counties of Lake and Porter, ordered that land located west of the current LaPorte-Porter county line be laid off into election districts and townships. The commissioners' order created three townships that covered all of present day counties of Lake and Porter, which were legally part of LaPorte County. Waverly Township was bounded by Lake Michigan to the north, the current LaPorte-Porter county line to the east, the line between Townships 35 and 36 to the south, and a line through the center of Range 6 West to the west. 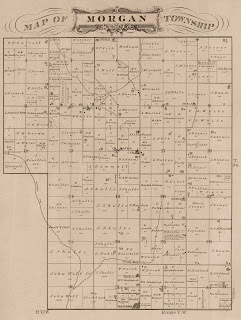 Morgan Township was bounded by Waverly Township to the north, the current LaPorte-Porter county line to the east, the Kankakee River to the south, and a line through the center of Range 6 West to the west. Ross Township comprised all the land west of the line through the center of Range 6 West. Thus, Ross township embraced all of present day Lake County, all of present day townships of Portage and Union, and portions of the present day townships of Boone, Center, Liberty, Porter, and Westchester. Settlement occurred rather rapidly and Porter County was officially created on January 28, 1836. At this time, present day Lake County was part of the newly established Porter County. Then on February 16, 1837, Lake County was created, essentially halving the size of Porter County. New townships were created in Porter County and boundaries were adjusted several times. 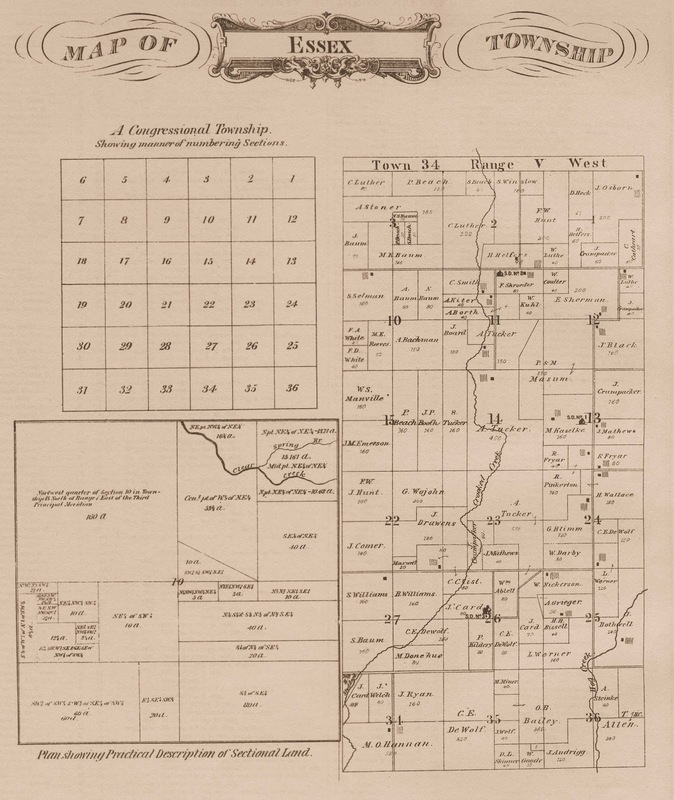 In February 1850, Porter County commissioners detached Sections 1, 12, 13, 24, 25, and 36 and east halves of Sections 2, 11, 14, 23, 26, and 35 in Township 34 North, Range 5 West, from Morgan Township and created Essex Township. This new township was quite small, 1.5 miles between its western and eastern boundaries and six miles in distance from north to south. Its total area consisted of nine square miles. Plat Map showing the original boundaries of Essex Township. shown in this map and attached it to Essex Township. Source: A. P. Abbot's Sectional Map of Porter County, Indiana, 1855. 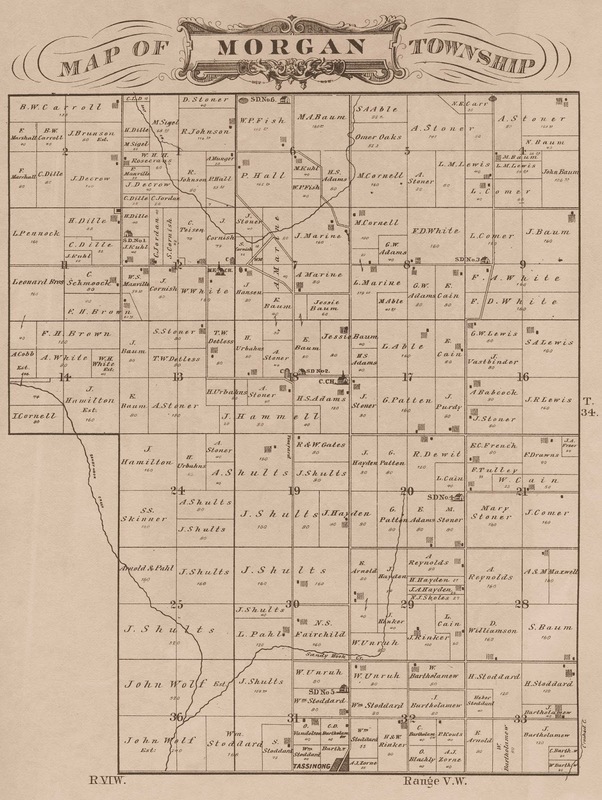 Essex Township doubled in size when the commissioners of Porter County severed another strip of land 1.5 miles wide from Morgan Township's east side and attached it to Essex Township in March 1855. In other words, Sections 3, 10, 15, 22, 27 and 35 and the western halves of Sections 2, 11, 14, 23, 26, and 35 were removed from Morgan Township. The 1870 Federal Census records reveal that a total of 36 dwelling houses existed in Essex Township that year. With such a sparse population, it would have been difficult to operate necessary township functions (e.g., elections, schools) and have enough individuals filling official township positions (e.g., justice of the peace, school commissioners, teachers, trustees). 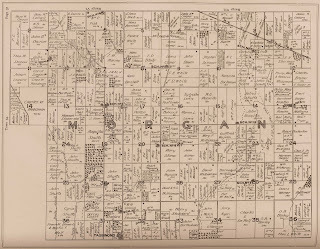 1876 plat map of Essex Township, Porter County, Indiana. 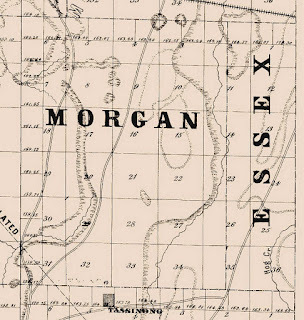 On petition of E. N. Sherman and others of Essex and Morgan townships, the territory of the former was annexed to Morgan township and the township organization of Essex abolished. Elections in the townships will hereafter be in district 4. What Morgan Township had lost 25 and 30 years earlier was regained as part of its jurisdiction. Morgan Township's boundaries have remained fixed for over 136 years. A complete list of individuals that served as Essex Township trustees does not exist. It is known, however, that Jason Osborn and James Black were two trustees of the township and that George Williams was elected a trustee but never served given that Essex Township was reattached to Morgan Township before he could serve his term. 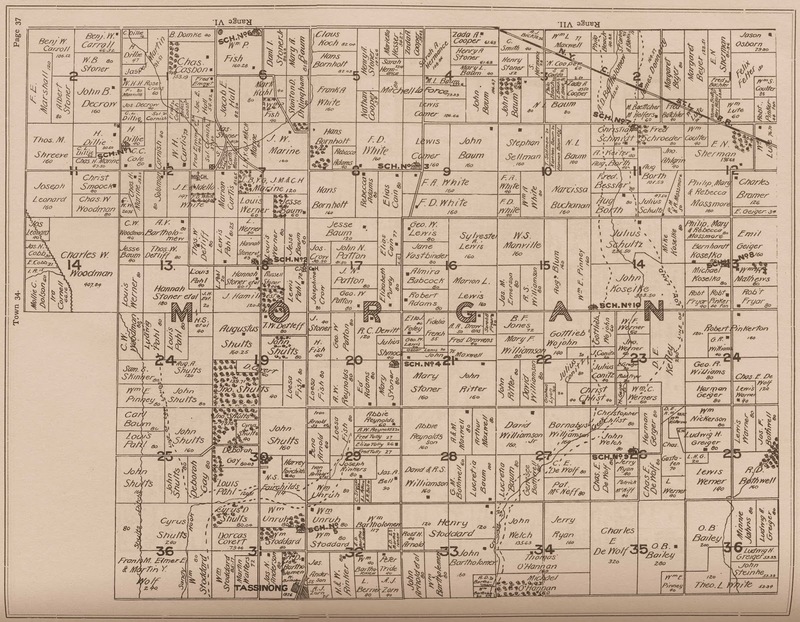 1876 plat map of Morgan Township, Porter County, Indiana. 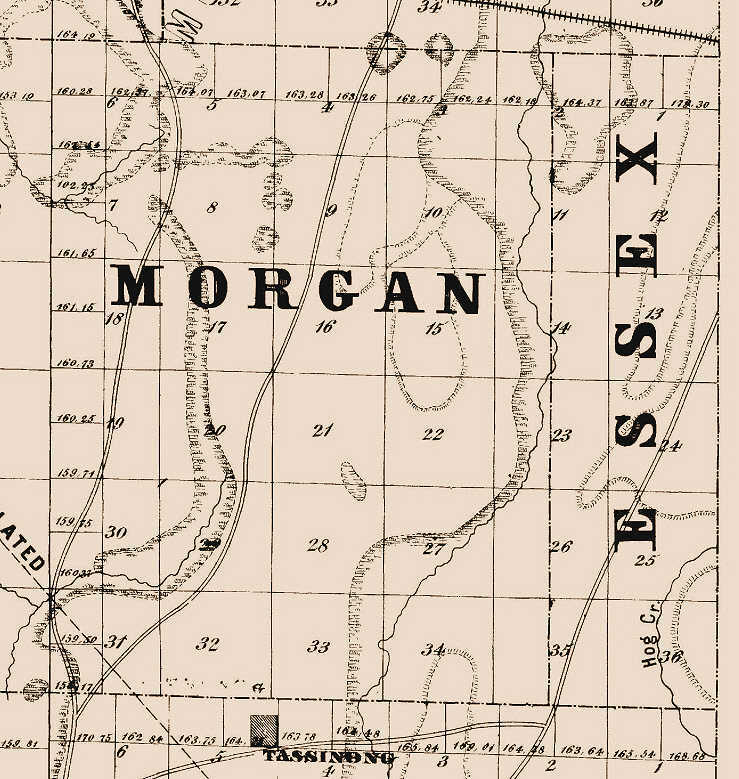 1895 plat map of Morgan Township, Porter County, Indiana. Source: Lee and Lee's Atlas of Porter County, Indiana, 1895. To some degree the name of Essex still persists within Porter County in the form of Essex Cemetery. This cemetery is referred to by a variety of names, including: Salem Evangelical and Reformed Church Cemetery, Salem-Friedhoff Cemetery, and Salem United Church of Christ Cemetery. The Essex Cemetery was established in 1891, after Essex Township had been reattached to Morgan Township, and dedicated in 1892. This cemetery is connected to the German Evangelical Salem Church (Salem United Church of Christ) located in Wanatah, LaPorte County, Indiana. A Salem congregation was started by German settlers who migrated to Cass Township, LaPorte County, Indiana, during the 1850s and 1860s. The congregation was formally organized on March 15, 1869, by Reverend Carl Schaub as the German United Salem Church (Die Deutsche Vereinigte Salems Gemeinde) of Wanatah, Indiana, and was affiliated with the German Evangelical Church of the West in St. Louis, Missouri. In 1875, land for a cemetery was jointly purchased in Wanatah by Salem Evangelical Church and St. John's Lutheran Church to be used for the burial of their congregants. By 1891, it became necessary for both congregations to find new locations for the purpose of burying church members. A new site located approximately one mile west of Wanatah in Porter County was acquired by the Salem Evangelical Church and formerly dedicated on January 1, 1892, by Reverend William Schulz. Ironically, Essex Cemetery is geographically located in Section 36, Township 35 North, Range 5 West, in the extreme southeast corner of Washington Township, adjacent to what was to be referred to as the Oak Grove Farm. The cemetery is bordered on the east by LaPorte County and on the south by Morgan Township. It is located off County Line Road East just south of US Highway 30, with railway lines along its southern boundary. ...the seal represents the ship "Essex" which [Admiral David] Porter commanded. The word "Essex" could formerly be read on the ship; but the latter is worn by long use, the name no longer legible. Campbell's seal was used by the Porter Circuit Court for decades. It is generally accepted that Porter County was named in honor of Commodore David Porter. An officer in the United States Navy, Porter commanded several ships during his service, including the USS Constitution, USS Experiment, USS Enterprise, USS Essex, and USS Firefly. He gained considerable fame during the War of 1812, where he and his crew represented the notion of American's want of free trade and captured the first British warship, the HMS Alert. In February 1813, Porter sailed his warship, the USS Essex, around Cape Horn into the Pacific Ocean. Here, he successfully attacked several British whaling ships, capturing twelve ships and taking 360 prisoners. To capture ships, Porter would raise the British flag on the USS Essex, sail up to the British whaler, board the British ship, and then reveal his true allegiance. 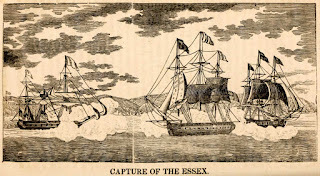 During the Battle of Valparaiso (Chile), on March 28, 1814, the USS Essex became so disabled that Porter was forced to surrender to Captain James Hillyar of the British Royal Navy. The USS Essex's losses included 58 dead and 31 missing of her crew of 154. Porter was soon released by his British captors and then appointed to command the USS Firefly. and HMS Cherub (right) in the harbor of Valparaiso, Chile, on March 28, 1814. Source: Bowen's The Naval Monument, 1840. Interestingly, Porter had a blot on his naval career. In 1823 he commanded a Navy expedition to the West Indies for the purpose of suppressing piracy in the region. During the expedition, Porter invaded the village of Fajardo, Puerto Rico, then a Spanish colony. The purpose of the attack was the avenge the jailing of an officer from his fleet. Porter was court-martialed for this invasion since the United States government did not sanction the attack. Porter resigned from the United States Navy on August 18, 1826, whereupon he entered the Mexican Navy as its commander-in-chief, serving in this position from 1826 to 1829. Upon leaving the Mexican Navy, Porter entered diplomatic services for the United States. He passed away on March 3, 1843, in Constantinople, while serving as the United States ambassador to the Ottoman Empire. The USS Essex was constructed by shipbuilder Enos Briggs at Salem, Massachusetts, at a cost $139,362. Building was initiated in 1798 and the ship was launched on September 30, 1799. Upon its capture in the harbor of Valparaiso, Chile, the ship became the property of the United Kingdom and renamed the HMS Essex. The British used the HMS Essex as a floating prison from 1824 to 1837 to house convicts in the harbor of Dún Laoghaire, Ireland. Convicts were then transferred to other ships and transited to Australia. The British sold the HMS Essex at auction on June 6, 1837, for £1,230. Lee and Lee. 1895. Lee and Lee's Atlas of Porter County, Indiana. Chicago, Illinois: Lee and Lee. 81 p.
Long, David. 1970. Nothing Too Daring: A Biography of Commodore David Porter, 1780-1843. Annapolis, Maryland: United States Naval Institute. 396 p.
Northwest Indiana Genealogical Society. 1993. Washington Township Cemeteries, Porter Co., In. Valparaiso, Indiana: Northwest Indiana Genealogical Society. Robotti, Frances Diane. 1999. The USS Essex and the Birth of the American Navy. Holbrook, Massachusetts: Adams Media Group. 302 p.
Porter County Vidette, Valparaiso, Porter County, Indiana; June 24, 1880; Volume 24, Number 26, Page 2, Columns 5-6. Column titled "Proceedings of County Board." The Vidette-Messenger, Valparaiso, Porter County, Indiana; July 24, 1934; Volume 7, Page 1, Column 1. Column titled "Striking Thoughts." The Vidette-Messenger, Valparaiso, Porter County, Indiana; August 18, 1936; Volume 10, Section 3, Pages 17-18. Column titled "Morgan High School History of Morgan Township: As Compiled by History Class and Instructors for The Vidette-Messenger." The Vidette-Messenger, Valparaiso, Porter County, Indiana; April 26, 1976; Volume 49, Number 249, Page 11, Columns 4-6. Column titled "Chesterton Senior Wins Flag Contest." The Times, Munster, Lake County, Indiana; January 18, 2004; Column titled "Original County Seal Unearthed," by Brian Williams.